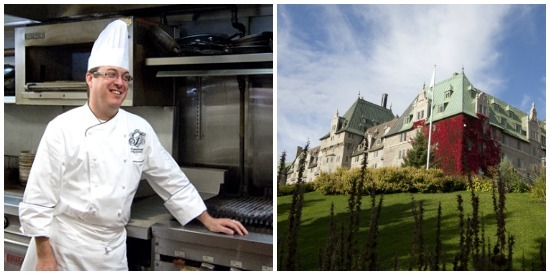 Patrick Turcot, Executive Chef at Fairmont Le Manoir Richelieu, uses the endless supply of regional ingredients from the Charlevoix region as his culinary inspiration. He works to deconstruct recipes, reinventing them with the products presenting the freshness and most intense flavours. Chef Turcot curates the latest CHEF'S BOX food of the month club for FoodiePages.ca. Below he shares his latest travels (including a stop in Justin Bieber's hometown!) and top five favourite meals of all time. Last place I traveled: Toronto with the family. We visited Canada's Wonderland and Justin Bieber's hometown for my daughter! Most romantic thing I've done for a girl: I proposed to my wife with the ring on a dinner plate. I get nervous when: When I am not organized and don't have free time for the emergency.